There is nothing like working with valuable, museum-quality paintings and sculptures. They are not only very beautiful but also significant in cultural, artistic, and historical terms, making such art pieces truly unique and important. At Fine Art Shippers, we are very proud to provide our safe art transport services to galleries and auction houses, shipping fine art of exceptional value for them and their clients both across the country and internationally. Moreover, our trained team of art shippers can handle literally any task, be it moving a huge marble statue or setting up an exhibition. Our expertise combined with the ability to provide only the best art shipping service in the USA makes Fine Art Shippers one of the most reliable art moving companies for art business professionals and individuals. It is needless to say that to be one of the best art moving companies means to provide a high-quality art shipping service in the USA and beyond. This is exactly what we offer our clients at Fine Art Shippers! From local relocation of valuable paintings and sculptures to international transportation of large art collections, no job is too small or too big for our dedicated team of art shippers. Plus, we offer a variety of in-house art packing and crating services to ensure that every shipment arrives at its destination in perfect condition. In other words, if you want your treasures to be delivered to anywhere in the world on time and without a scratch, you won’t find a better art shipping service in the USA than the one we offer at Fine Art Shippers. In addition to our comprehensive art shipping service in the USA, we also offer a full range of art installation services, all available at a reasonable price. Besides, Fine Art Shippers is proficient in setting up exhibitions of any kind, which allows us to work with many reputable galleries, museums, and auction houses, including Shapiro Auctions. 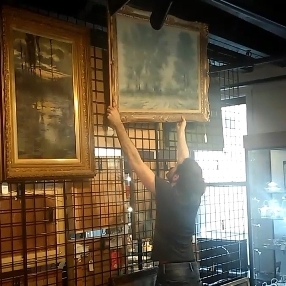 In the video below, you can see our team setting up a pre-sale exhibition for Shapiro Auction of Fine and Decorative Art, which was held in New York on June 2. Whether you need art installation, art packing, art crating, or art shipping service in the USA, Fine Art Shippers is always ready to help! Call us today for any art logistics support you need!